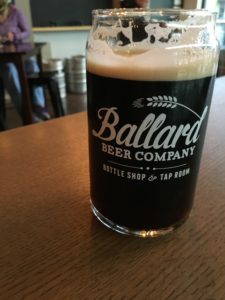 We’ve been in Seattle for just over a year now, and I’m finally beginning to develop a consistent list of favorite local breweries and beers, though I continue to discover new (or new-to-me) options on a regular basis. I’ve also been fortunate enough to have a fair amount of travel this year – mostly for work, but with some fun family trips thrown in as well – and while it is certainly possible to find mediocre IPAs across the globe, there are some real gems as well. As mentioned, Seattle Beer Week isn’t nearly as fully-featured as Philly Beer Week, but this brewed-for-the-event beer was outstanding – a perfect pale ale, full of flavor and subtlety. Can you tell I really like Reuben’s Brews? Their taproom is great, kid- and adult-friendly and their regular lineup is fantastic. This is now my favorite gose; it was perfect all summer, and frequently on tap at the Ravenleaf Public House which opened earlier this year – we have a local again! If you’re looking for a great burger (which was surprisingly hard to find in Seattle), it’s a must-visit. I’m so happy it’s just around the corner from our house. This was a road trip discovery; we came across the brewers at the farmers’ market in Bellingham, WA and could not have been more pleased. For those unconvinced that a 3.2% beer can impress, I’d suggest this – it was dark and toasty without being coffee-like, and was simply all-around delightful. I’ve been cheered to discover they now send some bottles to one of my local bottle shops; it may well become my Yards Brawler ‘replacement’ as a go-to beer. 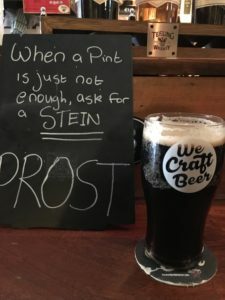 I was a bit wary before trying Optimism, as I’d heard they didn’t label their beers by traditional styles ‘to avoid limiting choice,’ but I found that by the time I visited they (more or less) had pretty standard descriptions. I enjoyed quite a few of their beers, but especially this ESB – I frequently complain that there aren’t enough around, certainly when compared to the ubiquitous IPA, but this one was especially nice. They also make a fine ESB, but I especially enjoyed this seasonal variant on their regular porter. Despite the name, it’s not overly sweet, but just right. I admit I am on the fence about this brewery as far as some of their ‘strange’ beers go; they just haven’t had the consistency of Tired Hands, who are strange alchemists when it comes to regularly pulling off the weird and wonderful, though I freely acknowledge my bias. That said, Helmsman is outstanding – a perfect mild, and one I’d happily pipe into my house if I could. Another great bitter! We’ve only managed to get to their new-this-year taproom once, but it was well worth the effort. Is it really a pale ale at 7%? Probably not, but it is a fantastic beer. I am a big fan of both Stoup and Cloudburst (more on them in a moment), and this was a top-notch collaboration. I complain a lot about all the ‘meh’ IPAs that seem to have taken over the world, but it’s nice to be reminded that there are some truly fantastic ones in this area. Some local beer nerds turn their noses up at Georgetown for (presumably) being easy to find on tap, making beer that tastes like beer and having been around a long time, but there’s a reason they are successful – it’s good beer. Having said that, the new kids are doing some amazing things – I don’t think there is a better brewery for IPAs anywhere on the planet than Cloudburst. Everything else they make is good too, but the IPAs are simply outstanding, and constantly rotating. They may well be the best brewery on this coast. This should not have worked for so many reasons, but it did. It was so good I sought it out multiple times. Another fantastic pale ale from a great Oregon brewery – perhaps we’ll finally make it down there in 2017. I am always a bit dubious about beers for which people make special road trips, but this lived up to the hype. Yes, this is a pale ale for which an old-school bottle trade is a worthwhile endeavor. I also made it to New York, Virginia and Texas on business trips this year, but alas, there was quite literally nothing to write home about from a beer perspective (not including the Mid-Atlantic beers I know and love from previous visits, and the fact that I did get to have a Hamilton-themed beer before seeing the show). We have yet to make it to Vancouver, but we did cross the border by water to visit Victoria. While most other local beer wasn’t especially impressive (at least in our limited sampling), everything at Spinnakers was wonderful, especially this hoppy/malty/roasty wonder. I enjoyed this on cask at one of the many Galway Bay Brewery locations scattered around Dublin; while their beers were pleasant enough, this one was special. I would love to see more breweries offer at least a few guest taps for friends, though I suspect that may be a vanishing trend. Yes, Guinness did taste different (and better) in Dublin, but it’s never been a favorite of mine. However, the Dublin Porter was wonderful; if the good people at Diageo began distributing this worldwide, I’d be most grateful. Our travels to the north of England were only a few days after my return from Dublin, so I wasn’t actively seeking out any more stouts, but this was a delight. Also delightful was The Knott in Manchester – wonderful, friendly staff and a wide selection of beers from around the world and around the corner. I know it’s becoming something of a broken record, but I love a good mild. Finding a great one was even better. We enjoyed this at The Ship & Mitre in Liverpool, which came highly recommended – while it did get crowded (and rightfully so, given their beer and food), it was an excellent find, so thank you, internet! And there you have it for 2016; I certainly left off quite a few excellent beers and breweries that I hope to re-visit in 2017 (looking at you, Salish Sea Brewing Company, Seapine Brewing Company and Stones Throw Brewery), but it’s clear my theme for the year was one of Great Normal Beers, because I’m at the top of the craft beer cycle again – or maybe it’s because 2016 decided to bring the weird in so many other ways that I simply needed beer to trend in the opposite direction. Regardless of the reason, I’m looking forward to exciting new beer experiences in 2017; farewell, 2016!